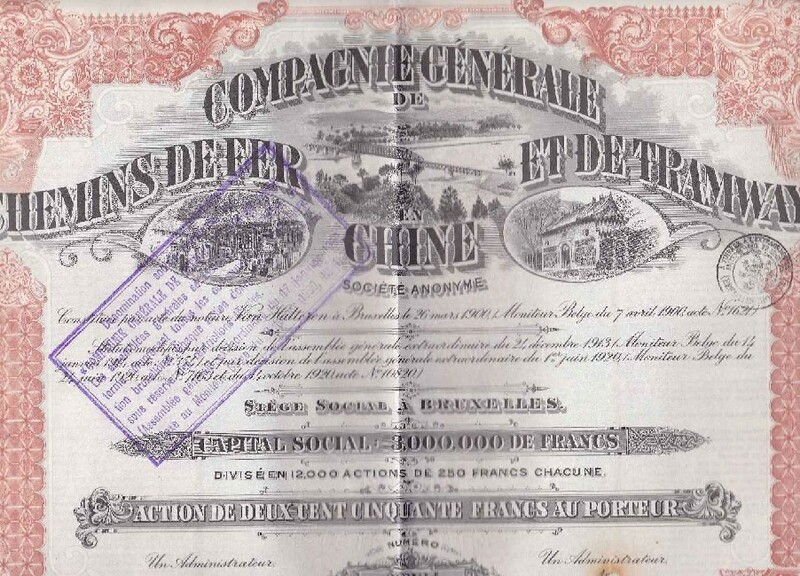 S4006, China Far-East Railway Co., Stock Certificate 250 Francs 1900. Please refer the picture, VF condition. The face language is in French. Issued in French or Belgium. With two holes, which means cancelled. Size: 370mm*280mm. In very large size. 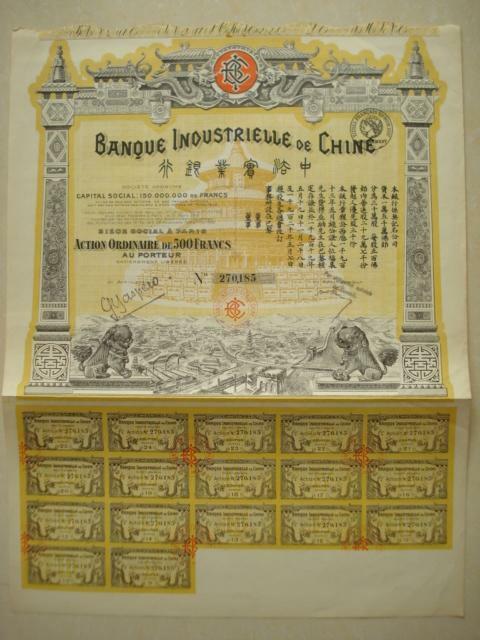 S4007, Banque Industrielle De Chine, Stock Certificate 1 Share, 1920. 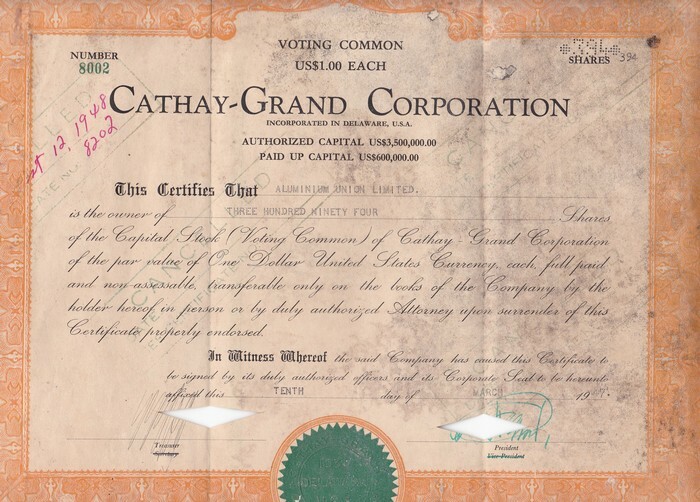 Cathay-Grand Cinema Co., Voting Common Stock Unused, Shanghai 1930's. Cathay-Grand Cinema Co., Non-Voting Common Stock Unused, Shanghai 1930's. 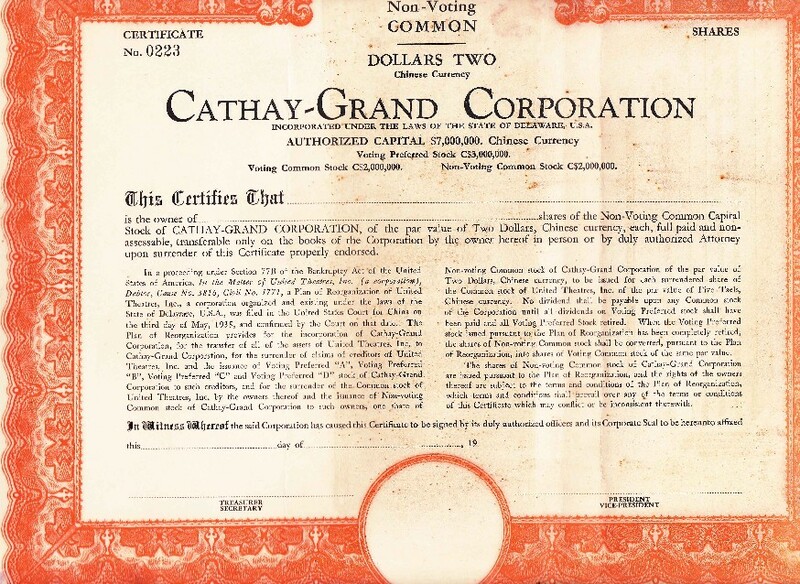 Cathay-Grand Cinema Co., Non-Voting Common Stock 100 Shares, Shanghai 1937. 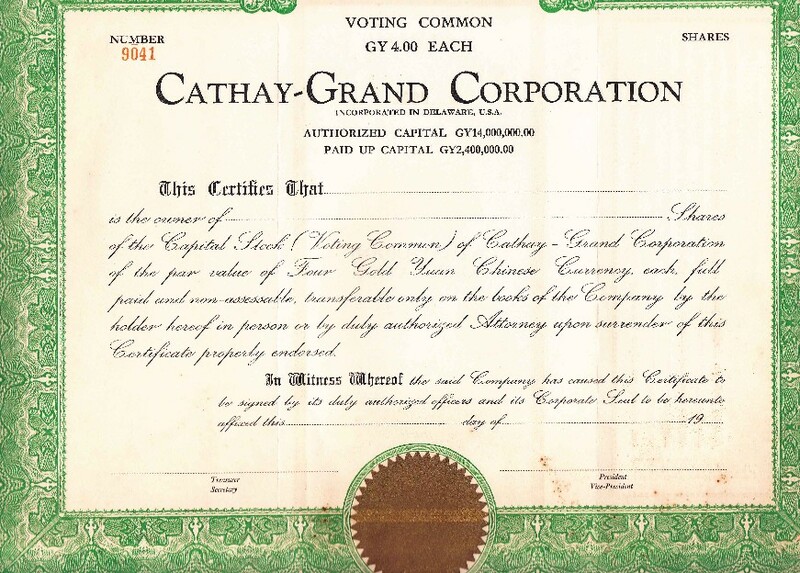 Cathay-Grand Cinema Co., Voting Common Stock 100 Shares, Shanghai 1937. 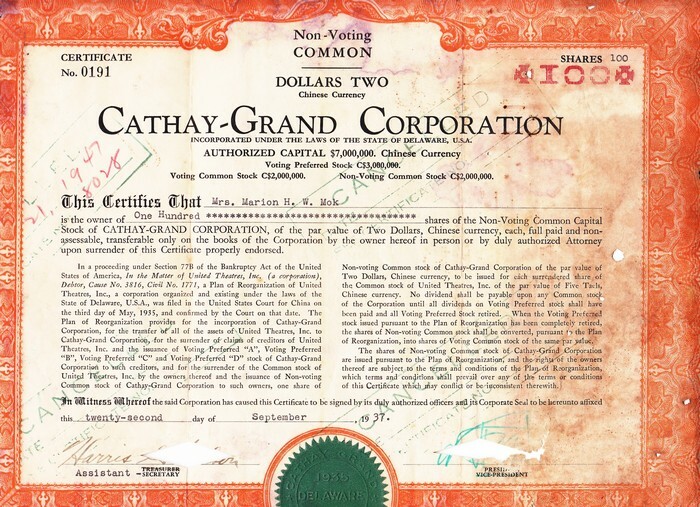 Cathay-Grand Cinema Co., Preferred Stock 50 Shares, Shanghai 1936. 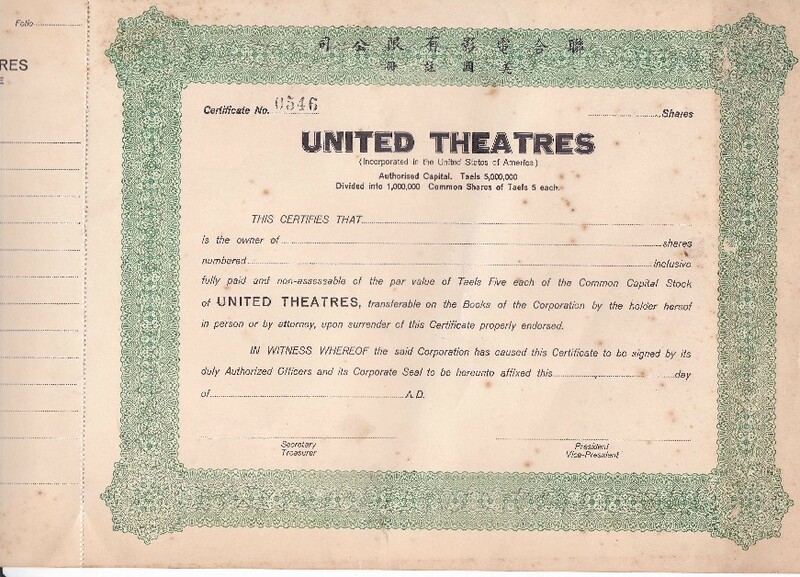 United Theatres Co., Stock Certificate 200 Shares, Shanghai 1932. 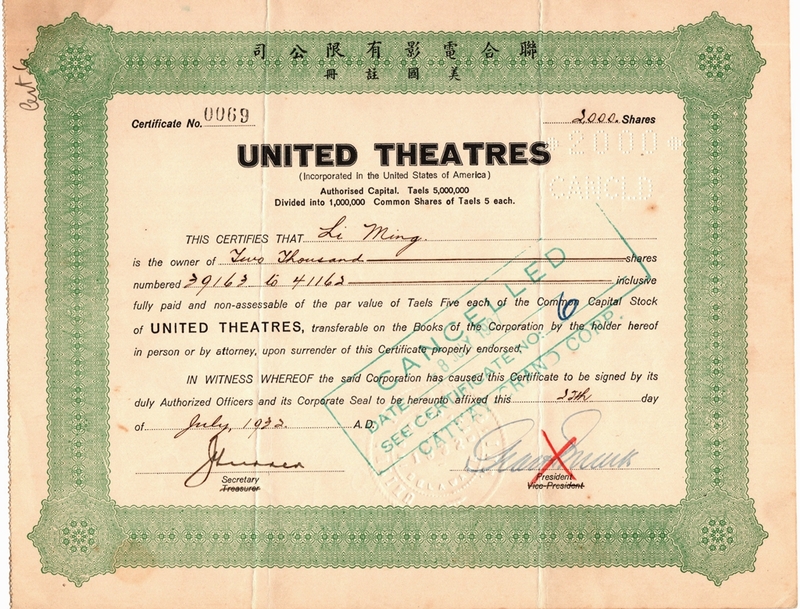 United Theatres Co., Stock Certificate Unused, Shanghai 1932. 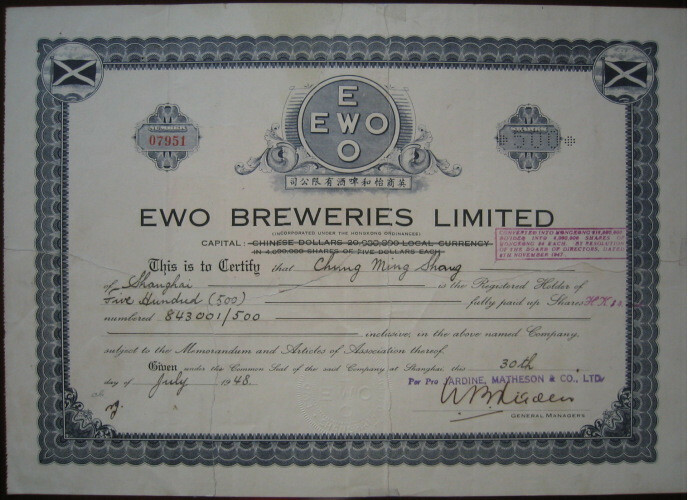 EWO Breweris Limited, Stock Certificate 500 Shares, Shanghai 1940. English Languege Shares. 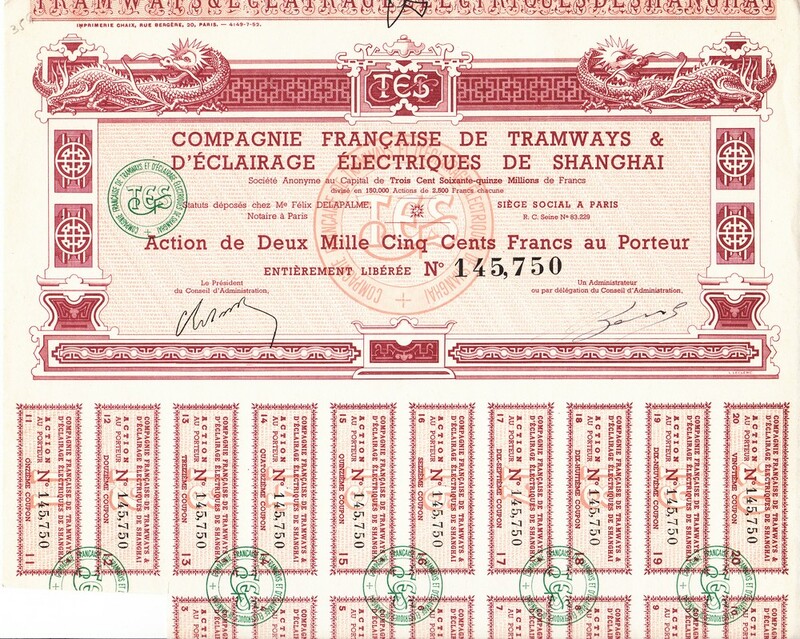 S4026, EWO Cotton Mills, Ltd, Stock Certificate 100 Shares, 1947 Shanghai VF condition, with 11 pcs revenue stamps. Issued in 1947 in Shanghai. 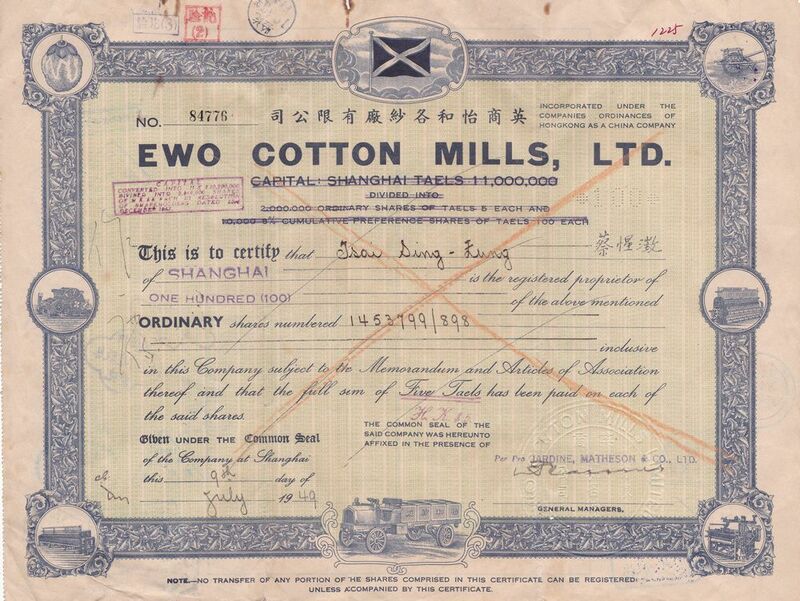 EWO Cotton Mills, Ltd is a British invested company in Shanghai. Face value: 100 Silver Dollars. 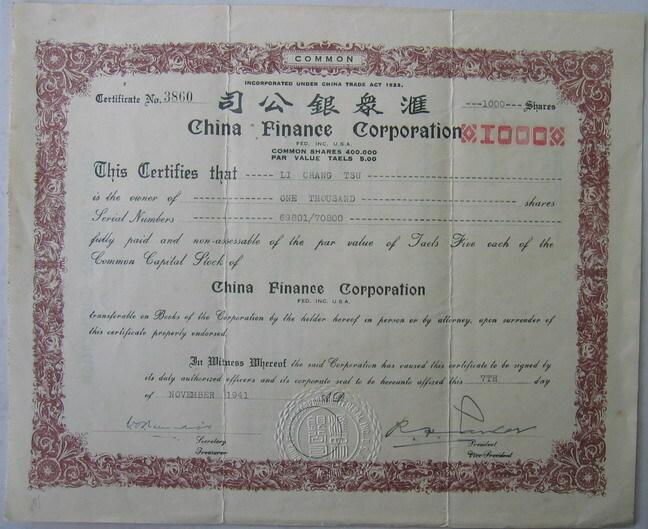 China Finance Corporation, Stock Certificate 1000 Shares, 1942. 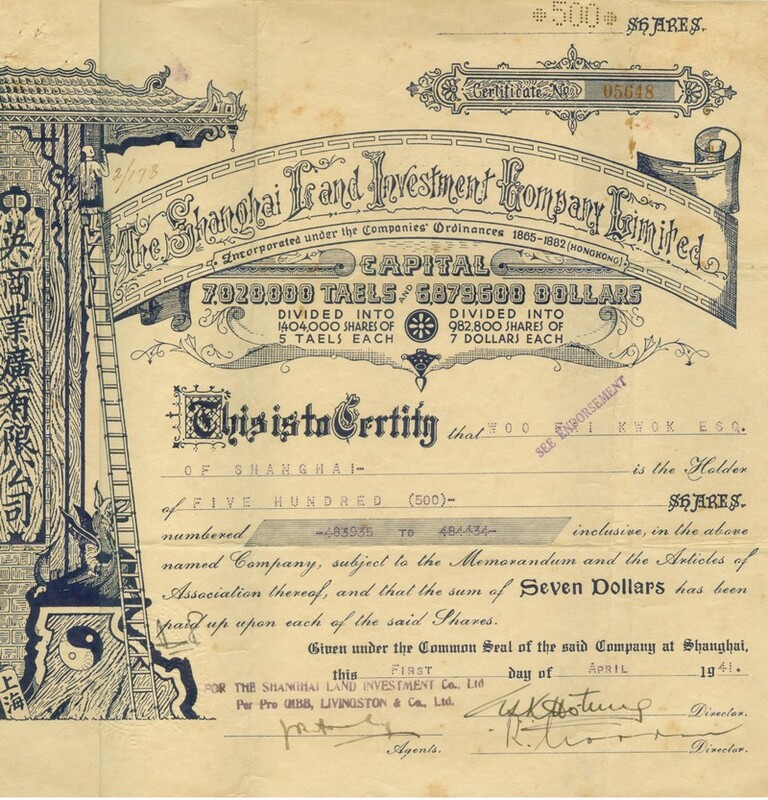 Shanghai Land Investment Company Ltd, Stock Certificate 500 Shares, 1941. 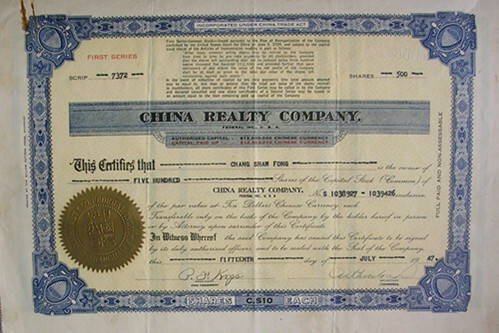 China Realty Company, Stock Certificate of 1947. Rare!! 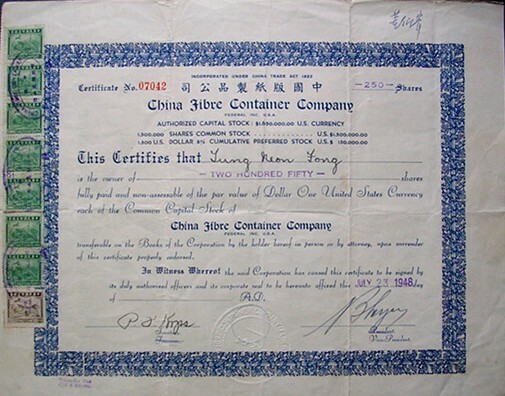 China Fiber Container Company, Stock Certificate of 1948. 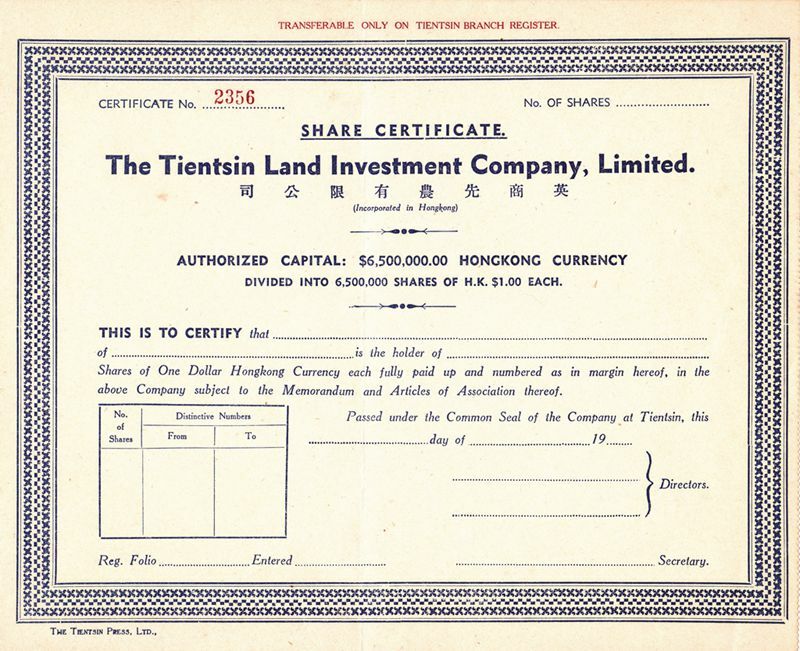 The Tientsin Land Investment Company, Stock Certificate of 1930's, Unused. 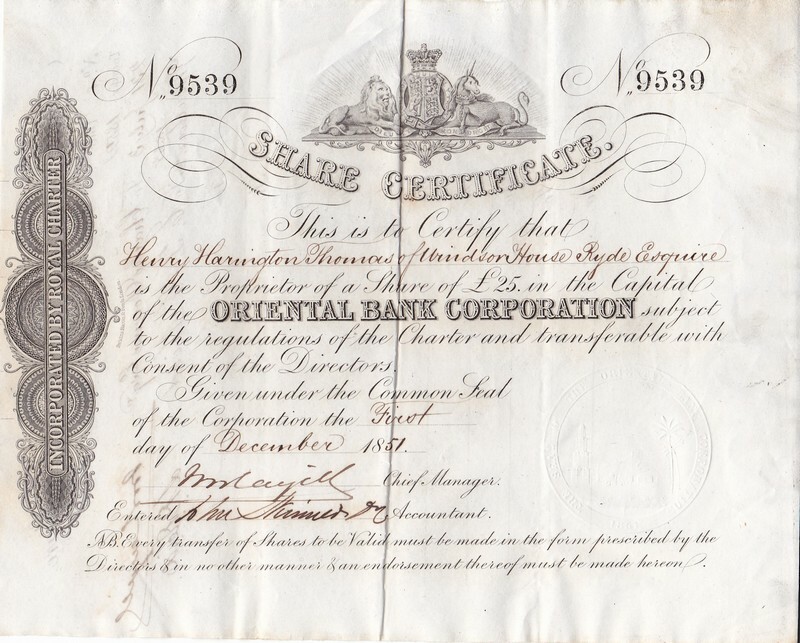 S4037, Shanghai Worsted Mill Ltd. Stock Certificate 100 Shares, 1948. VF condition, issued in 1948 in Shanghai. Face value: 100 Shares. Each share is 5 Dollars. 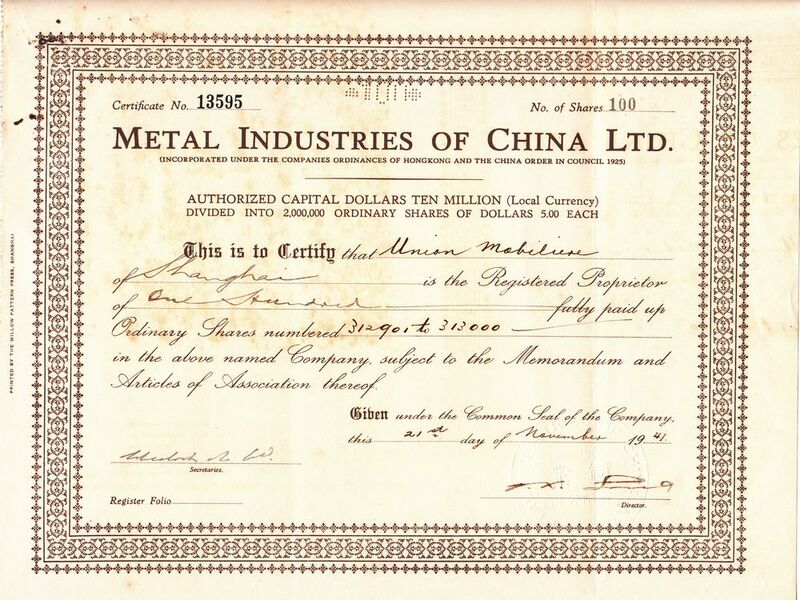 S4039, Metal Industries of China Ltd. Stock Certificate of 100 Shares, 1941. Issued in 1941 by British Metal Industries of China Ltd.in Shanghai. The face value is 5 China Dollar per share, that is 500 China Dollars in all.